I haven't been able to tell from the pictures in the promotional material, but was the cue ball in the Trakball controller originally white? All of the ones I've seen on ebay have yellowed cue balls. I'm wondering if that's just a sign of age. I own three NIB Trak-Balls, and they're all the exact same shade of light yellow, so my guess is that this was the original color. I believe it was meant to match the yellow of the arcade Centipede trak balls. The ivory color is correct. If it was age damaged like fire retard plastic you wood see a lighter shade underneath. You are correct in labeling it as a Cue ball. I took my Trakball for cleaning and dropped in a pool table eight ball to verify. 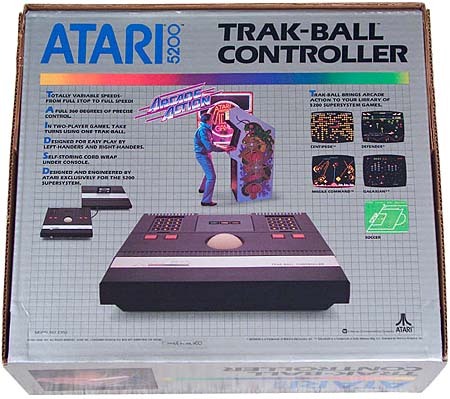 Even the original packaging shows an ivory colored Trakball. The Atari Business Is Fun book by Curt Vendel and Marty Goldberg includes a story about a truckload of cue balls meant for the 5200 trackball scattering all over the warehouse. Broken 5200 - No Power!